Klipsch®, a tech-driven audio company, today announces the debut of its Reference Dolby Atmos® enabled home theater speakers, adding to their award-winning Reference Premiere series with the same groundbreaking sound technology. Dolby Atmos delivers captivating, object-based sound that places and moves audio anywhere in the room to bring entertainment alive all around the audience. With Dolby Atmos, sound comes alive from all directions, including overhead, to fill a home theater with astonishing clarity, detail, and depth. Klipsch produces the only two-way, horn-loaded Dolby Atmos enabled speakers in the market today. Controlled directivity has been at the core of Klipsch acoustic design principles for more than 70 years. This, coupled with proprietary Tractrix® horn technology allows the speakers to meet the directivity and sensitivity specifications required for Dolby Atmos enabled speakers. “As demand for Dolby Atmos technology has grown, we are excited to offer a wider range of options that deliver this immersive and emotive sound experience with all the power, detail and emotion that Klipsch is known for,” stated Rob Standley, vice president and general manager, professional and component speaker solutions at Klipsch. The Klipsch Reference Dolby Atmos enabled home theater speaker line up consists of two models that accompany the existing Reference series. The all-in-one solution Klipsch R-26FA tower speaker with an integrated height channel reflects sound off the ceiling to deliver the overhead Dolby Atmos experience. 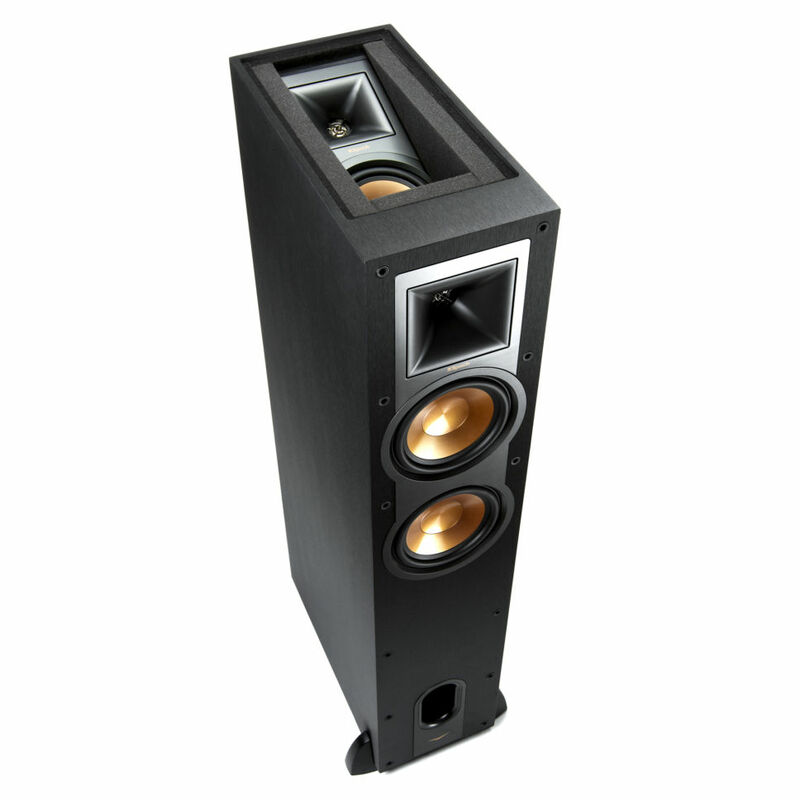 The Klipsch R-14SA elevation speakers add the Dolby Atmos effect to any existing bookshelf or tower speaker to complete a hemisphere of rich, detailed sound, or can also be used as a side surround speaker for standard surround formats. Both models feature iconic copper spun Injected Molded Graphite (IMG) woofers that, when combined paired with Klipsch Tractrix horn loaded technology and Linear Travel Suspension (LTS) tweeters, produce maximum speaker efficiency. The Klipsch R-26FA (US MSRP $599 ea.) and R-14SA (US MSRP $399 pr.) are available in a black brushed polymer finish. They are now available at select retailers and at Klipsch.com. For more on the brand and its Reference enabled Dolby Atmos speakers, visit Klipsch.com. Dolby Atmos delivers moving audio—sound that can be precisely placed and moved anywhere in three-dimensional space, including overhead. It brings entertainment alive all around the audience in a powerfully immersive and emotive experience. To learn more about Dolby Atmos, visit Dolby.com/Atmos.